My first full day during my Hawaiian holiday visit, mom and I met some friends of the family for brunch at the Kings View Diner in Kapa'au. Good place, I recommend it if for some reason your travles take you through my hometown someday. This is the Kings View's spam, egg, and cheese croissant sandwich. I have a native (by birth anyway) Hawaiian's deep affection for spam, although I don't eat it very much nowadays. And the sheer incongruity of spam on a croissant made this choice a no-brainer for me. However, I've realized too late that this photo is a failure, because you can barely see the spam. 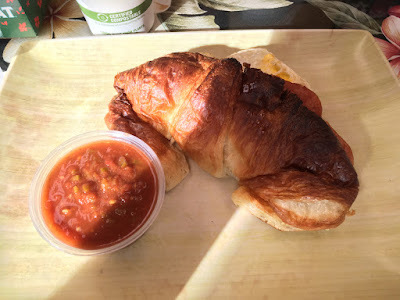 On future brunches there I will think more carefully and open the croissant before snapping the picture. For the record, it was absolutely delicious.